I have been getting many hits on the blog from people looking for information on the Qball so I had to dig deep to find some more Qballs out on the interwebs. 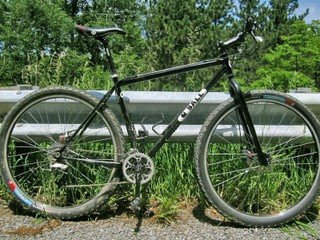 The first one is a geared version from the Bicycle Escape, which is a bike shop in Maryland that sells Qball frames. Scott Quiring is a Michigan frame builder that has mastered the art. His custom line (branded Quiring) is built from the ground up per customer specifications. His Qball line of frames are super high value USA crafted frames for a rider looking for the best balance of value and quality. Both of these bikes are of course available atwww.thebicycleescape.com. Found these two on a QBall thread on MTBR. 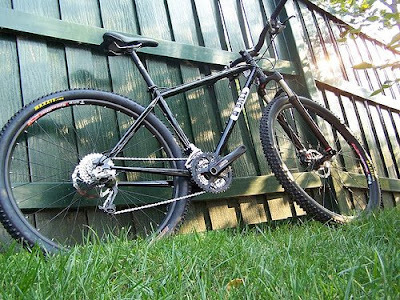 In fact, I think this thread was the one that convinced me to pull the trigger on this bike. Essentially the first bike I purchased without a road test. Can you guess who I am in the thread? Tip for running gears: Surly Monkey Nutz II aid with shortening the horizontal dropouts and allow the use of almost any front derailuer.